Anderson and his men walked along the banks of the Thompson River between the mouth of the Nicola and the place where the Thompson flowed into the Fraser. 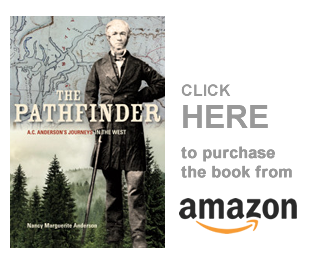 In 1847, Alexander Caulfield Anderson set out on his second set of expeditions between the fort at Kamloops, and Fort Langley on the lower Fraser River. He began his journal with the words: “Weds. 19 May  — At 10 a.m. set out from Kamloops, striking towards Lac de Nicholas (Nicola Lake). At 5 p.m. (having delayed to refresh the horses during the interval) we reached the first brook running towards Lac de Nicholas, where we encamped. So here is some information about the five men who accompanied Anderson on this journey down the Fraser River to Fort Langley and back. Montrose McGillivray is the most interesting of the following men, and I have been following his story through the fur trade journals for a little while. He was a bit of a scamp, frankly. He was half-breed (as the term was at that time) having been born to Simon McGillivray and a Native woman, about 1822. He came to the Columbia district (west of the Rocky Mountains) in 1838 as an apprentice-clerk and was employed at the HBC’s post in California. Unfortunately he was dismissed by William Glen Rae for excessive drinking, and he returned to Red River. A few days later, Anderson sent McGillivray down the banks of the Fraser River while he went down in a canoe. “Accordingly, I dispatched Mr. McGillivray to pass the party by the land track marked on Pahallak’s sketch, while with Montigny & some Indians I proceeded in a canoe by the river. In 35 minutes we reached the head of the Falls [the canyon above today’s Yale], running a small rapid by the way. Several hours after the party arrived, Mr. McGillivray reporting very unfavorably of the road…..” along the rocky river bank. Edouard Montigny was Anderson’s interpreter, and he also accompanied Anderson on his earlier expedition in 1846. He must have been Metis, but no one knows where he came from. Quite probably he was the son of Ovid de Montigny who was, for a little while, stationed at Kamloops where Edouard joined the fur trade. When I say that Edouard was the interpreter, that means that he had a good understanding of the local Indian languages and could communicate with the Natives they met. Interpreters were fairly important people in the fur trade, and they earned a bit more money than the other employees. Montigny was an experienced employee and trusted with chores the other men were not. In 1846, Anderson wrote that: “Leaving the rest of the party to repose for a while, I send Edouard Montigny to explore one side of the river for some distance, while I went personally to examine the other.” Later, Anderson’s Sto:lo guides “are quite at a loss as to our position, knowing nothing of the country and puzzling themselves and the interpreter, Montigny, with fifty silly conjectures…” And later in this 1847 expedition, Montigny will approach an armed Native and gently remove the gun from his hands. The fur trade had many interesting stories…. Theodore Lacourse also accompanied Anderson on his first expedition in 1846, and so his story has been told in an earlier post. Theodore was born in Quebec in 1823, so he was French-Canadian, not Metis. 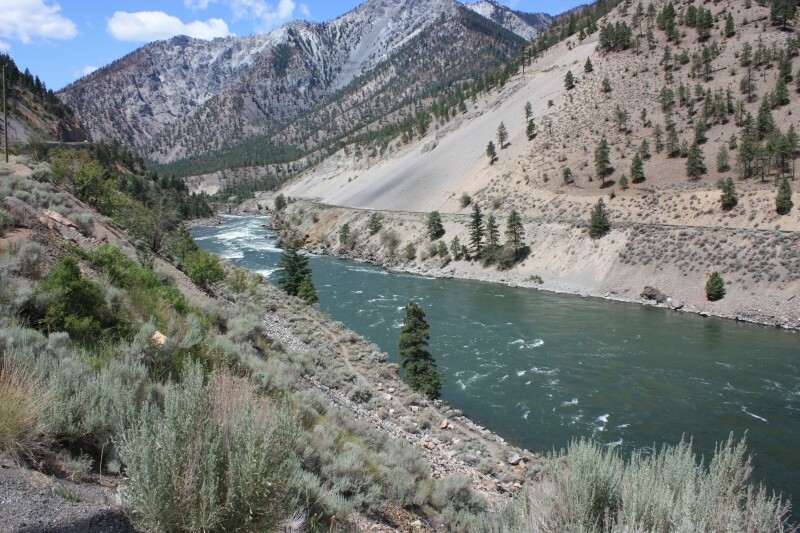 By 1840 he was in New Caledonia at the Thompson’s River post [Kamloops], where he was assigned to accompany Anderson’s expedition from Kamloops to Fort Langley. Michel Fallardeau joined the HBC in 1827 and came west with York Factory express in the fall. For the next twenty years he worked at interior posts and likely spent much of his time at Kamloops — hence his falling in with Anderson on this occasion led to him being assigned to Anderson’s exploration party. He died in about 1855, though the records are not clear — he appears to have been beaten so severely by Paul Fraser that he died two days later. When Paul Fraser told the Iroquois that was building Fallardeau’s coffin that rough boards were good enough for the “rascal Fallardeau,” the coffin builder stated that rough boards were not good enough for Fraser’s own coffin. A short time later, Fraser was killed by a falling tree. The suspicion remains that Fraser’s employees intentionally dropped the tree on his tent. Joe Desautels, was Joseph Desautel DeGaspar who later spent time in the area around Fort Colvile. Born in Montreal, French-Canadian Desautel joined the HBC in 1843 and came west, where he spent the rest of his life except for a short visit to the east coast at the end of his first contract. Throughout his career with the HBC, he moved progressively south, finally ending up at Fort Colvile at the same time Anderson was in charge of the place. Desautels retired in 1852, and settled on his own property in Stevens County. After selling that property he returned to Colvile, and finally settled for the second time at Curlew Lake — which on Anderson’s 1867 map of British Columbia is called Eliza Lake (for his daughter). Joe Desautels DeGaspar married the daughter of Joseph laFleur, who was for many years in charge of the Okanagan post near Fort Colvile, and he has many descendants in the region. So both Michel Fallardeau and Joe Desautels were older than the other men who accompanied Anderson on this expedition, and both had long and interesting histories in this part of the world! At this time, Alexander Caulfield Anderson was about 35 years old. The only photographs I have of him were taken when he was a seventy-year-old with white hair — it was a shock to suddenly realize that at some point in his life he had brown hair, and was thirty years younger than I am now!